Sarah's Mountain Hideaway is the perfect getaway for a family with young children or for a romantic getaway for the mountain lover. This lovely cabin is 2 bedroom, 2 bathroom with a loft that has 2 twin beds. The cabin features a great mountain view, a fully furnished kitchen with stainless steel appliances, an oversized jetted tub in the master bath, a wood burning fireplace, a built in fire pit outside for those fun times of making family memories, satellite television, high speed internet,and a Playstation 4 game system. Sarah’s Mountain Hideaway also has a toddler bed in the master bedroom & a crib for your infant! The swing on the back deck Enjoy soaking in the luxury hot tub, under a canopy of stars, feeling the stress just slip away. Because this Sarah's is located inside Coosawattee River Resort, as a guest you will have access to the resort's amenities including the indoor heated pool, fitness center, tennis courts, game room, miniature golf course, multiple parks on the river, fishing pond and more. So why wait? 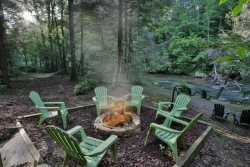 Pack a bag and come on up and experience what being in the North Georgia Mountains is all about! Very clean. We thoroughly enjoyed our stay. Everything went smoothly. We usually use VRBO, but saved money using your site. This has been one of our best experiences. We worried at first, but everything was done just as expected. My family really enjoyed our stay. Cabin was great for kids and adults. Deer EVERYWHERE which was very relaxing. Just a pleasant experience overall. The cabin and surroundings were absolutely gorgeous. We enjoyed the decor of the cabin, as well as, the scenery and wildlife.Unfortunately, our brief weekend stay included the "once in a decade" storm (thunder, lightning, rain, hailstones, and a rash of tornadoes). The loss of power was inconvenient, particularly with the well water, inability to cook or store food.The loss of air conditioning made it difficult to sleep.The tornadoes rendered most roads inaccessible, hence we could not make our way out of the resort, or enjoy the resort amenities. We spent a major portion of our stay assisting the local residents clear trees from the roads. We were happy to lend a hand. It was a joy to us to be able to help others in a time of need. All in all, our stay at Sarah's Mountain Hideaway was quite an adventure. Happy. Will be back soon. Of all the things you do, go by the directions Mountain Oasis gives you. I went by Google maps and we went down narrow, winding roads. That was totally my mishap. This cabin rental was the best overall experience I have had with my husband in 17 years. Overall was an enjoyable experience with the cabin itself meeting our expectations. Beautiful cabins. Great company and reservations were easy. This home was all I wanted it to be. Lots of extras that made it even better. Beautiful views, clean, and comfortable. We loved the resort, from the deer to the rec center. We would love to visit your area again in the near future. Amazing service even on a very spontaneous booking! We had a great time on our yearly fall trip and the cabin was very accommodating. It had plenty of space for our family and furry friends! The view and surrounding landscape was very pretty and we enjoyed the fire pit/ hot tub on the cooler nights. Our most fav thing was seeing the beautiful deer everywhere on the property and throughout the neighborhood! Thanks for everything! We enjoyed our stay. The cabin was so comfortable. We loved it. Very clean and stocked cabin. No problems with booking, or directions. We've been completely pleased both times we used this company. The biggest difference in other cabins we've noticed is the cleanliness. Great location in a gated community! View from deck is awesome. Wineries and Orchards close by. We enjoyed our time at Sarah`s Mountain Hideaway. Nice cabin with all the items needed for an enjoyable stay and plenty of room. The location was great, with plenty of activities on the resort property to keep everyone busy. We enjoyed the fire pit and the hot tub as well. It was nice that the cabins/houses had good size lots and were not super close to each other. Great little cabin, amazing view. I've stayed at Sarah's Mountain Hideaway two times now and had a great experience both times. This is a beautiful cabin in a great location. I will definitely stay again! This was our second stay With Mountain Oasis. My family and I enjoyed both of our stays thoroughly. Mrs Debbie and her staff are polite, courteous and always willing to help. I find this refreshing in this day and age when customer service seems to take a back seat a majority of the time. As a matter of fact, everyone we encountered during our stay was helpful from the local Wal mart to the gate security staff, they all seemed happy to share their town and its amenities. If we return to the area which I feel sure we will, Mountain Oasis will be our first choice when choosing our lodging. Thanks again. My husband and I had a wonderful time at Sarah's Mountain Hideaway. The wildlife was abundant! We saw many animals while sitting on the large back deck . Very peaceful . Thanks for such a relaxing stay .